Who loves natural, gently fragrant, skin loving soaps and the deliciously scented, warm glow of a beautiful candle? Just only everyone I know! I used the Vanilla set I received from Lather, last year to show you how the soap and candle look, once unwrapped and lit up. That soap is a year old and still smells as lovely as the day I received it and the candle has not only a sweet, gourmand scent, it gives fantastic scent throw. My whole beauty room was fragrant with vanilla in mere minutes and the scent lingered for a while, after I blew the candle out. 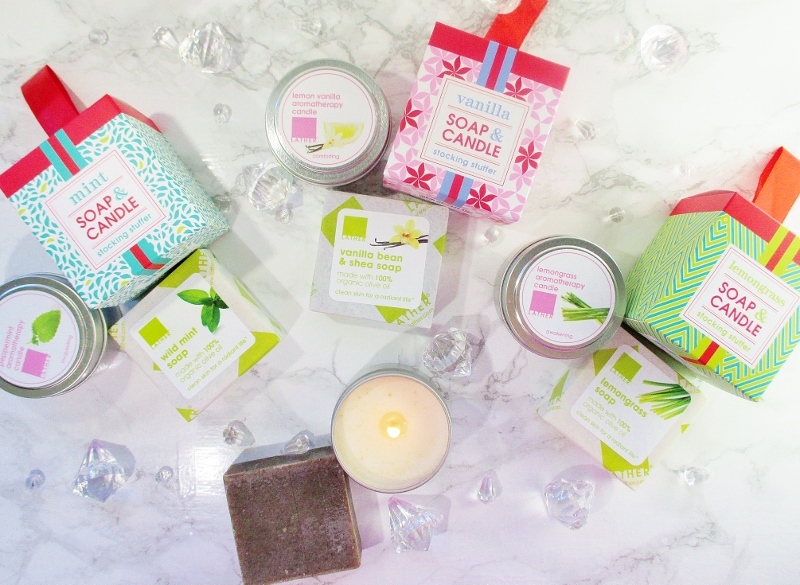 Mint Soap & Candle Stocking Stuffer is a refreshing hit of mint to awaken the senses. Vanilla Soap & Candle Stocking Stuffer combines sweet, creamy vanilla with a hint of fresh, bright lemon for a soothing experience. Lemongrass Soap & Candle Stocking Stuffer is a revitalizing spa experience in a cute little box. These candles come with a little bit of the natural product sprinkled on top. The vanilla is coarse, natural sugar. For safety, I suggest that you clean off as much of the sprinkles as you can, before lighting. After a long day out in crowded malls and shops or a vigorous snowball fight out in the cold, who loves to sink into a hot, beautifully fragrant bath, lie your head back and just... relax. 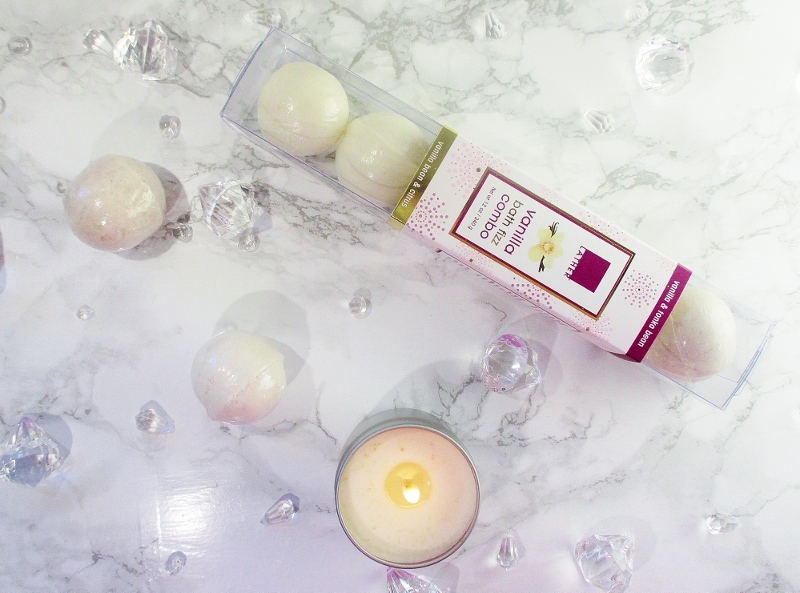 Turn on the tap and toss in a few Vanilla Bath Fizz Combo balls and let them fizz away. Step in and let the warm, soothing Vanilla Tonka and refreshing Vanilla Citrus bring you back into balance while the mineral and emollient rich ingredients pamper your skin. Cold, dry air, searing winds and indoor heating all mix and mingle to leave our lips dry, chapped and painful. 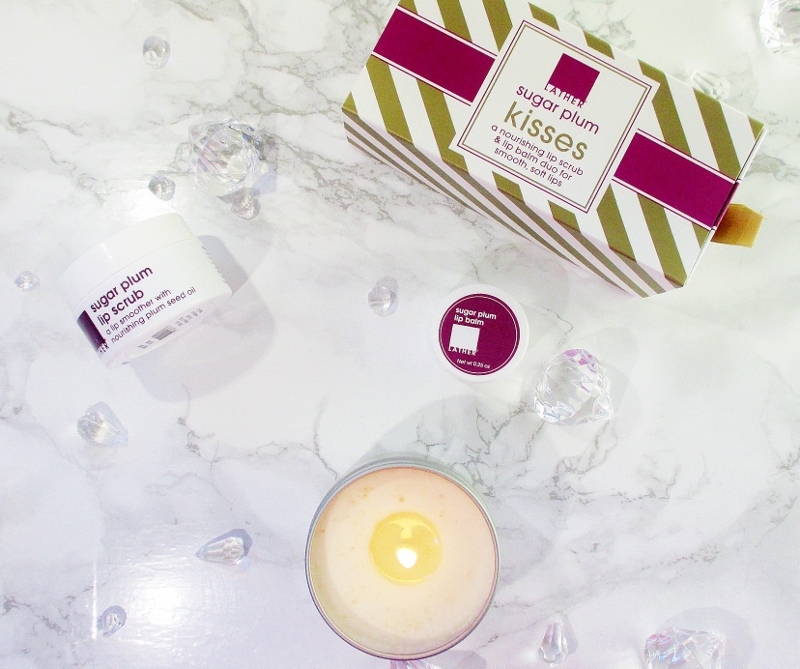 Reverse their evil effects with Sugar Plum Kisses Lip Scrub and Lip Balm. Let the nourishing combination of Plum Seed Oil, rich in Vitamin E and natural sugar crystals gently buff away dry, flaky skin, leaving your lips looking and feeling smooth and renewed, then apply the Lip Balm to hydrate, protect and give you pillowy soft lips ready for an encounter under the mistletoe. I had to include a picture of these opened so that you can see the gorgeous, rich plummy colour. 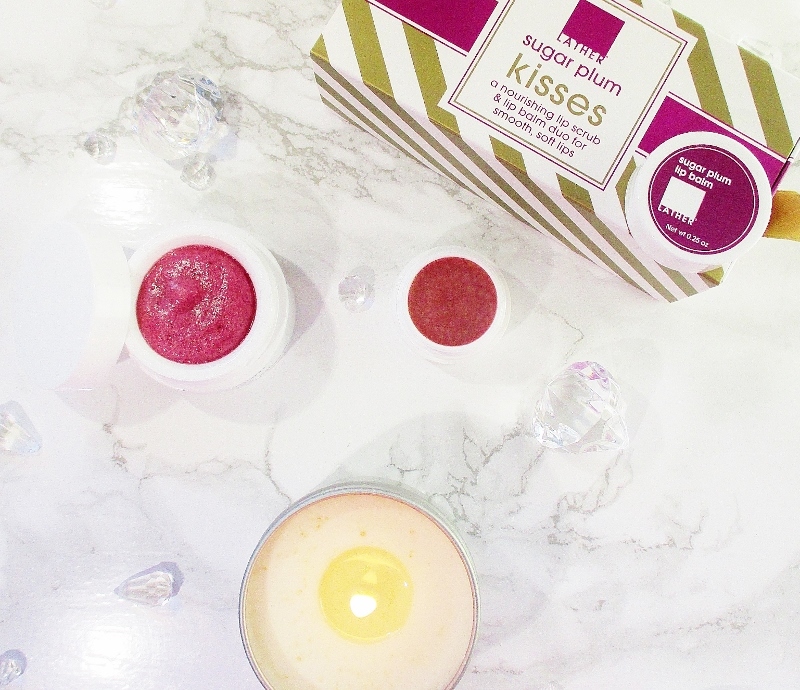 This lip scrub and lip balm smell just as delicious as they look. 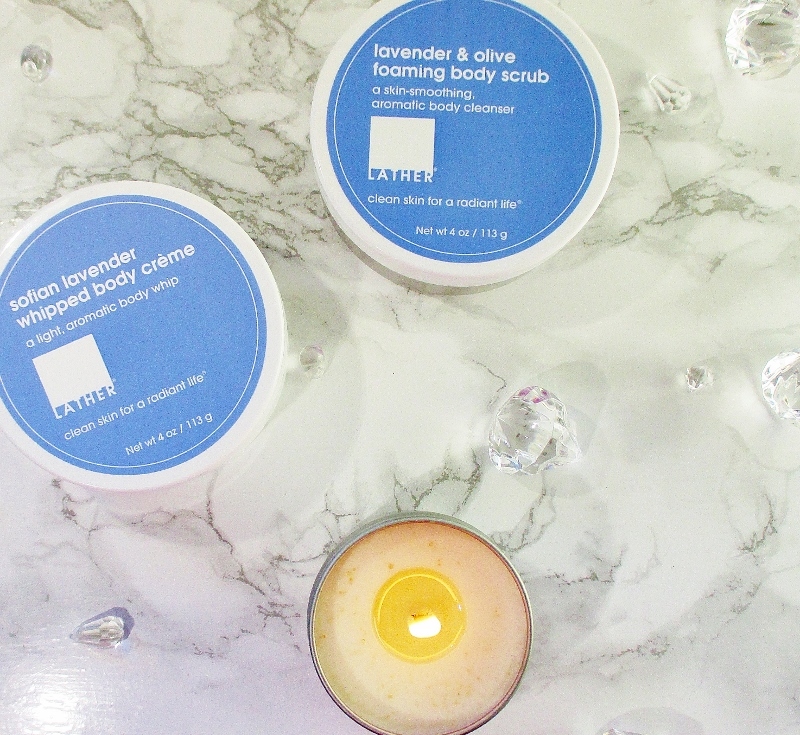 And of course, what Lather Gift Guide is complete without Lavender Retreat? Let the Lavender and Olive Foaming Body Scrub buff away dry, flaky Winter skin skin and leave you feeling fresh and utterly smooth, all over. Follow up with the Sofian Lavender Whipped Body Creme for the most velvety soft skin you could imagine and a relaxing sensory experience. Slip into your favorite, cozy PJ's, curl up by a roaring fire and sip a mug of steaming cocoa and reflect with satisfaction on your day. If you are ready to indulge someone special or yourself, head on over to Lather online and check out their Holiday Gifts and more or pop in to one of their retail locations in Pasadena, California, Scottsdale, Arizona, Atlanta, Georgia, Fairfax, Virginia and Honolulu, Hawaii. See Lather's Store Location Page for locations, contact info and store hours. Are you planning to pick up a few of these lovely little gifts to give? What are your favorite Lather goodies?